Tags: Bass recording and mixing techniques, Microphones in home recording. This tutorial presents and evaluates two popular ways of recording bass guitar in your computer: direct injection method (DI) and the bass guitar amplifier method. In direct injection; it is very simple, you will simply plug the bass guitar ¼ jacks directly into the audio interface pre-amp input and start tracking. The bass guitar amplifier method uses a bass amplifier cabinet and a microphone. The microphone is pointed into the amplifier cabinet while the microphone is plugged to the audio interface pre-amp input. 1.) Adjust EQ of the bass amplifier cabinet for best bass guitar recording tone. 2.) Adjust the distance of the microphone to the bass amplifier cabinet for bass tone and desired room reverberation. 3.) Trying different types of microphone to get the best response. 1.) Adjust the preamp gain so that the recording level peaks between -15dBFS to -6dBFS. 2.) Once the recording level is good, open your recording software (this tutorial is using Reaper DAW). And then check if the recording level is consistent with your recording software. 3.) Finally hit the record button and start recording the bass. During the recording, make sure it does not clip but stay within the target zone: -15dBFS to -6dBFS. Tips for recording quality: Some audio interface does not have preamp on its input. They only have “line inputs” that assumes that the signal is already in line level. If you plug the bass guitar to the line input then the recorded signal is weak and noisy because the recording signal does not pass the microphone pre-amp. Therefore; make sure that the bass guitar is plugged to an input that accepts instrument level signals and it will be processed through a pre-amp. If you are a beginner, read this post regarding the difference between line level, instrument level and microphone level signals. In this section, let’s try recording the bass guitar using a bass amplifier cabinet with Rode NT1A condenser microphone (any other condenser microphones with good bass response is OK). 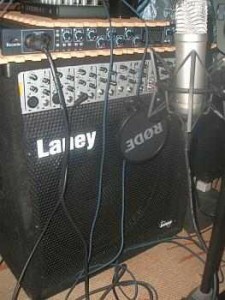 This example uses a Laney cabinet but this works with any bass guitar amplifiers. 1.) Plug the bass guitar cord into the bass guitar amplifier inputs. 2.) Listen to the current bass guitar tone, if you want some deep bass to be captured by the microphones. Then adjust the EQ of the bass cabinet accordingly. For example, you might decrease the mid and treble controls to a minimum while you will maximize the bass frequency for deep bass reproduction.